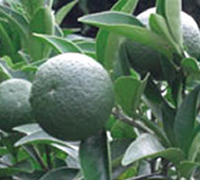 Daidai is a shrub of the mandarin family. Hagi daidais are harvested from the middle ten days of September to December. One daidai tree bears fruits successively from generation to generation without fall. So it is called fruit of happiness and people plant the tree in their garden as their wish to flourish. When people eat sashimi with Daidai juice, they call it a delicacy. A series of Daidai products from Yuzuya is one of the best of its kind and it has a special fresh, simple, and sweet flavor. Yuzuya’s effort and love for Daidai. Special feature of Yuzuya Daidai juice. What is 3 notable functions? In Kawakami village in Hagi, Yamaguchi, they grow a lot of Yuzu from since the olden times. There are a lot of Yuzu trees and they bear excellent fruit. 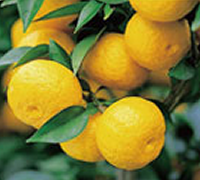 It is not easy to harvest Yuzu because of the thorns on the branches which causes trouble for Yuzu farmers. At the bottom of the mountain, you can see the wild Yuzu trees. Also you can enjoy the natural scenery that you normally cannot see except in this natural producing area. We provide a wide variety of products such as Yuzu vinegar to Yuzu tea. 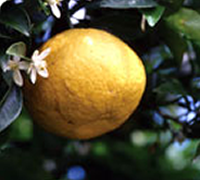 Natsumikan citrus processed by Yuzuya honten is very delicious since it’s grown in the magnificent nature of Hagi and it has received a lot of the blessings from sunlight and the area. Natsumikan is a special product of Hagi, Yamaguchi. The trees were planted as relief work for the samurai warriors, who lost their position after the Meiji Restoration. Today, you can see the old world scenery of Natsumikan bear on trees and white wall here and there in the castle town in Hagi.It’s described as Natsumikan and “white wall.” You can’t see this scenery outside of Hagi, and it has been voted and viewed as “top 100 scenery with fragrance”. On the flowering season, the Natsumikan floral scent spreads out all over the town.